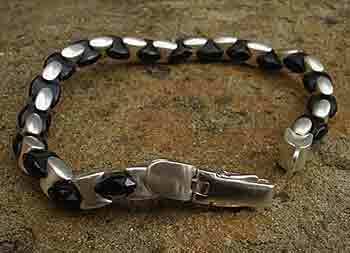 MEN'S SILVER BRACELETS : BRITISH Made : LOVE2HAVE in the UK! The Best! British made men's silver bracelets all handmade in the UK at prices you can afford. All pieces are fully guaranteed, and returns are accepted. Other materials combined with sterling silver make wonderful complimentary combinations, and for men's jewellery, they are nothing more than ideal. The wearing of wristbands in the alternative and rock scene has been widespread for decades now, and when a material such as rubber comes combined with silver, the bracelets look super cool. We have a fantastic selection of combination pieces that are all very organic in style and range from jewellery inspired by the natural world and the spiritual aspects of life, as well as textured pieces designed for more urban environments. Most of the men's bracelets in this section are available as necklaces too, and you will find them all listed in the men's silver necklaces section. Prefer a non-leather version of one of our men's silver bracelets combined with leather?